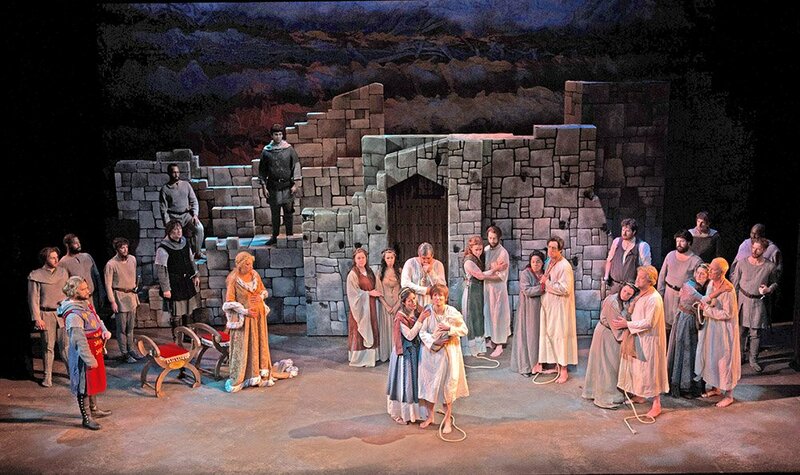 In Odyssey Opera’s Thursday performance of Domenico Gaetano Donizetti’s rarely mounted L’assedio di Calais (The Siege of Calais), Gil Rose led the assorted forces with his accustomed clarity and assurance. Strong on all fronts that matter, from set design, stage direction, costumes, singers, and orchestra, the show delighted from beginning to end. Anyone with a love for Italian opera should immediately secure tickets for Saturday’s reprise at the Huntington Avenue Theater. The action centers upon English King Edward III’s 1346 siege upon the French coastal city of Calais in an attempt to add yet another country to his growing British Empire. The citizens of Calais boldly continue to refuse to surrender, so Edward sends an envoy carrying a message of dire portent the French – we British will spare the people and city of Calais under one condition: you must choose six of your own to be publicly sacrificed as “ransom.” Six Frenchmen—including father and son Eustachio and Aurelio—volunteer to be sacrificed. The condemned men give keys to the city to King Edward and prepare to meet their doom. In French opera of the time, a happy ending was expected, so Donizetti provides one. Queen Isabella – notably pregnant and thus sympathetic – takes pity on Aurelio, his wife, and their infant son and intercedes. The English officers join with their Queen, and King Edward allows the six burghers their freedom, resulting in general rejoicing. The strong cast was led by baritone James Westman in the demanding lead role of Eustachio de Sainte-Pierre, the besieged Mayor of Calais, whose city has been suffering under a lengthy attack by British forces led by Edward III, King of England – nobly sung by baritone John Allen Nelson. 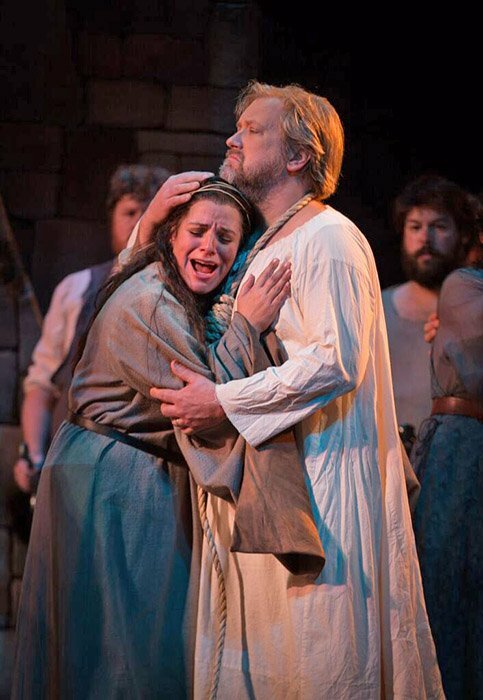 Mezzo-soprano Magda Gartner energetically and beautifully sang and acted the “trouser” role of Aurelio, Eustachio’s son. Lucia Cesaroni, soprano, was Eleanora, Aurelio’s wife. Cesaroni often performed in the shadow of Aurelio, yet she managed to shine forth on several occasions with a slightly tremulous instrument that was not devoid of emotional content and sympathy. Neal Ferreira, lyric tenor, Alan Schneider, tenor, James Demler, baritone, Christopher Carbin, bass-baritone were ardent and wholly believable as Burghers of Calais. Baritone Sumner Thompson sang the unsympathetic role of Edmondo, an English General who brings King Edward’s bad news to the people of Calais with gleaming tone and authoritative demeanor. Deborah Selig, singing Isabella, Queen of England, was both amusing and regal, bedecked in ermine, and not so subtly critical of her husband’s tactics of war. The libretto for this unusual work was developed by Salvatore Cammarano, a frequent collaborator with Donizetti, and a skilled dramatist. Cammarano skillfully joined two operatic traditions—Italian and French—in L’assedio di Calais, creating a concise drama that flows with inexorable energy as it colorfully and poetically depicts the course of events. Donizetti’s 49th (!) opera, as Laura Pritchard pointed out in her essay, contrasted markedly with the composer’s contemporaneous masterwork, Lucia di Lammermoor. L’assedio consciously minimizes the role of the prima donna—a typical Italian opera conceit—and focuses most of its attention on male roles, though Aurelio’s music is unrelentingly dramatic and very wide-ranging in tessitura and coloratura demands. Indeed the sonorous male chorus assembled by Odyssey Opera took on stardom. While relatively small in number they sang with fervor and focus the entire evening—a tribute not only to Donizetti’s skill but also to Chorus Master Mariah Wilson’s thorough and effective preparation. The handsome stage design was created by Dan Daly. Towering rock walls were ingeniously used for palace interiors and exteriors and allowed for some dramatic climbing up and down and impressive leaps by cast members. Joshua Major, Stage Director dramatically blocked and realized the action. The entirety was skillfully lit by Dennis Parichy, Lighting Designer. I was also impressed by the period costuming, elegantly rendered by Brooke Stanton, Costume Designer. The superiority, grace and virtuosity of Odyssey Opera Orchestra warrants nods. Cellists David Russell and Nicole Cariglia , who together and separately gave forth real musical involvement and gorgeous tone. The French Horn section of Kevin Owen, Clark Matthews, Whitacre Hill and Alyssa Daly projected a richly golden burnish, and woodwinds, in particular flautists Sarah Brady, Jessica Lizak and Rachel Braude triumphed over Donizetti’s considerable demands. Clarinets, Jan Halloran and Gary Gorczyca handily met brilliant virtuoso challenges. The ensemble stands before the Calais ramparts in the handsome production designed by Dan Daly and stage directed by Joshua Major. Get your tickets HERE for Saturday, and enjoy to this gem of an offering from Odyssey Opera! Indeed sonorous male chorus assembled by Odyssey Opera took on stardom. The review seems to suggest that the happy ending was Donizetti’s idea. Though the story may seem operatic in the extreme, it is taken directly from Froissart’s Chronicles, which date from the late 14th century, only a few decades after the event. Donizetti (or his librettist) doesn’t seem to have changed much, except the name of the English queen, which was Phillipa of Hainault. Of course Froissart may have prettied up the details a bit; he was a member of Queen Phillipa’s retinue. The “family loved one” in the photo of Alan Schneider can be credited as ensemble singer, Alexandra Dietrich. This opera was a real discovery for me. Quite glorious, especially Act II which, among other fine moments, features a soprano-and-mezzo duet that is clearly modeled on the great Norma-Adalgisa duet, “Mira, Norma,” in Bellini’s “Norma” and is hardly less beautiful. It was exquisitely sung last night (Saturday). A word on the so-called “softened” ending of the opera: Though it’s true that Froissart relates the release of the burghers at the pleading of Edward III’s wife, Philippa of Hainault, the burghers’ self-sacrificing “bravery” and Queen Philippa’s merciful intercession, have seriously been questioned by scholars (Philippa was Froissart’s patron, and Froissart himself came from the county of Hainualt and would obviously want to make Philippa look good). A fascinating book by Jean-Marie Moeglin of the University of Paris (“Les Bourgeois de Calais: Essai sur un Mythe Historique”) traces the complicated inconsistencies among the earlier chroniclers and the later discoveries about Calais’ traditional rituals of self-sacrifice (there was a deal: the burghers apparently knew when they paraded in their noose-halters that they were no longer in danger). Fascinating stuff! See The Guardian’s review of Moeglin’s book here. So Donizetti and his librettist might well have given in to Froissart’s pro-Philippa propaganda by “changing” the true historical facts to a mythical “happy ending,” but it was always the happy ending that endured in the minds of the French, despite the opera’s source in a play by Luigi Marchioni that apparently concluded with the deaths of the burghers (I don’t know this for a fact, since I don’t have access to the text of that play). In reality the burghers never died as Edward’s victims, but neither were they ever the self-sacrificing “heroes” of Froissart’s Chronicles or Donizatti’s opera. I’m guessing that any references to “changes” from a sad ending to a happy one probably refer back to Marchioni’s play. “The Siege of Calais” was written by Donizetti in 1836 in an attempt to garner a contract with the Paris Opera; it received sixteen performances in the next few years, and then… nothing until 1990, when it was performed at the Donizetti Festival in Bergamo. Even more striking is that the American premiere occurred only this past summer, at Glimmerglass! And now, the Boston premiere performed at the Huntington Avenue Theatre by Odyssey Opera under the direction of Gil Rose. I heard it Thursday evening; it was different from the Glimmerglass production (which I also attended), but just as moving and enjoyable. Glimerglass set the piece in our day, reminding us of the “siege of Calais” that took place this year as immigrants from the Middle East were expelled from their “camp” near Calais. Odyssey Opera, on the other hand, set the piece in the 1300s, leaving contemporaneous applications to us. I was thrilled with both productions, and I hope we won’t have to wait 170 years to hear the opera again! I was fortunate enough to see both the Glimmerglass (I go there every summer) and Odyssey productions. Glimmerglass set the opera in our time, basing the city of Calais on our evening news images of Aleppo and other mid-east cities after catastrophic bombing. Citizens lived in the ruins of their former buildings which they accessed by climbing over mounds of rubble. It was a most eloquent statement of their suffering. Both productions were excellently sung and played although I think Boston’s was a bit more dynamically conducted, while Glimmerglass had a more commanding Queen, a tall, statuesque woman who confronted her husband fearlessly and told him exactly why he wasn’t going to do what he proposed to do. During and after both productions I heard appreciative comments from audience members astonished that so good an opera had been neglected for so long.